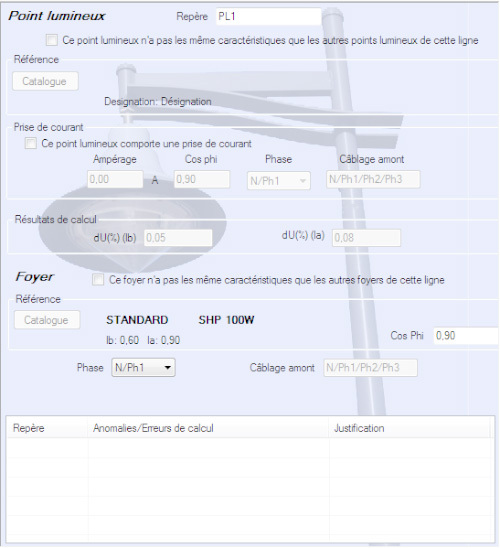 As a street lighting sizing software, elec calc™ EP generates the installation in the form of a tree view based on the information provided by the user. 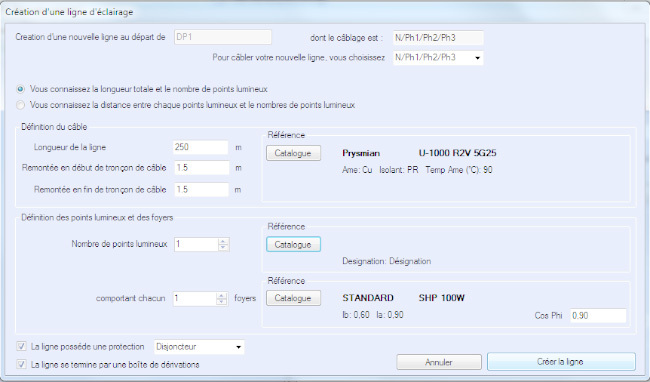 The selection of an element of the installation shows on the right side of the interface the element’s technical characteristics to be defined by the user. Presence of other tasks (power plugs). The voltage drop calculation takes into account the distribution type of the line (single-phased or three-phased), as well as the repartition of receivers on each of those phases. Any anomaly is highlighted by a red alert message which explains the correction to be made (for example, « invalid protection, incorrect thermal adjustment », « magnetic adjustment set up too high » or « the voltage drop cannot exceed … »).